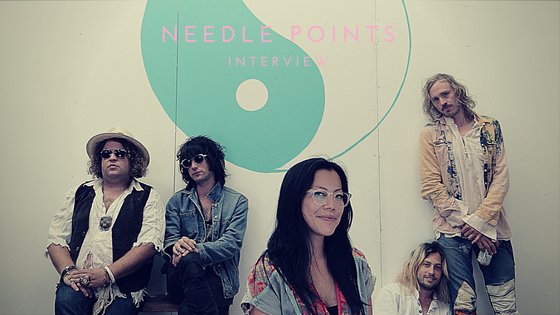 When psych-boogie band Needle Points began their Yin Yang Eyes Tour earlier this year, there was a bittersweet sentiment going into it. Right before they embarked on their tour, they had decided that they would be taking an indefinite hiatus when they returned. Danielle Kinoshita, percussion, and Colin Holloway, vocals, were making the move from the east coast to the west coast. It was a tough decision, but it was decided that working together long distance was not something they were able to commit to. And that’s okay. A major – and intimidating – aspect of being a member of a band is being able to know what works and what doesn’t work. It begins with setting goals: is this a serious aspiration? Is this a side project? Is this a group of people coming together to have a good time? Creating a reasonable yet aspirational project is the beginning to set up the success that follows. With Needle Points, discussing the relocation of Kinoshita and Holloway was not only crucial to each member but it also brought out a good sense of what was to come next. For drummer Jordan Kaplan, the Yin Yang Eyes Tour brought a lot of ideas to the table. It was a challenge that paid off and gave him ideas for his next move in the music industry. By accomplishing that half hour goal each day, his reflection on his interest in continuing that type of documentation gave him inspiration to set a new goal. In addition, he feels that one of his major accomplishments – NeedLove Records – can now receive more of his attention. His better grasp of the business side has come from making mistakes and learning from them, and now he’s looking into passing that knowledge down to others. The possibilities of his future are endless. An “indefinite hiatus” can sound menacing but sometimes can be inevitable. While the present has slowly shifted to the past, it’s the future of the members of Needle Points that matter now.